Salvadori’s Teal; Snow Mountain Quail; Chestnut Forest-Rail; Dusky Woodcock; Goldie’s Lorikeet; Mountain Kingfisher; Macgregor’s Honeyeater; Crested Satinbird; Papuan Grassbird; Greater Ground-Robin; Lesser Ground-Robin; Alpine Robin; Wattled Ploughbill; Northern Logrunner; Papuan Whipbird; Blue-capped Ifrita; Torrent-Lark; Splendid Astrapia; King-of-Saxony Bird-of-paradise; Superb Bird-of-Paradise; Brown Sicklebill; Lesser Melampitta; Archbold’s Bowerbird; Alpine Pipit; Mountain Firetail; Snow Mountain Munia. The Wamena & Lake Habema area is superb for birdwatching. A great number and variety of species are present, including some pretty special birds. Most people visiting aim for the Lake Habema track and/or the Ibele trail as these are among the most accessible locations. For the adventurous there are undoubtedly many more sites to be discovered. 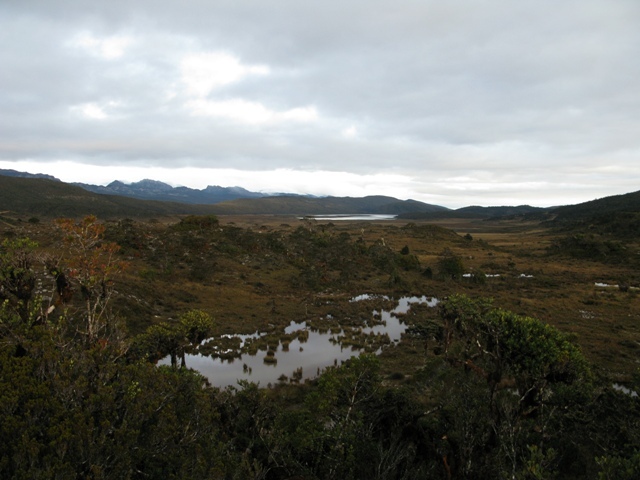 From Wamena, at around 1,600 m, this track climbs up through forest to Lake Habema at the tree line at 3,300 m. It is navigable by 4×4 in a bumpy ride of 4-5 hours. The track passes through a range of habitats and altitudes much of which is good for birding, and different habitats and altitudes support a different range. The first good roadside forest appears at around 2,500 m above the last village. Here there is a roadside hut that can be used for a camp. The forest is rather degraded near to the road but this at least makes it quite good for seeing birds like parrots and this is a good area for Goldie’s Lorikeet. In order to see another sought after speciality of this altitude, King of Saxony Bird-of-Paradise it is probably more reliable to drop down into the undisturbed valley to the north via a number of small indistinct trails that descend. A rocky stream bed can be followed along this valley and King of Saxony BoP display in the tall trees above the stream. 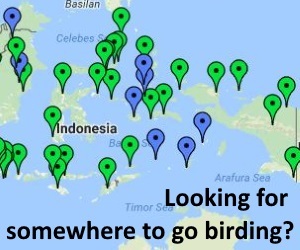 Other good birds in this area (both along the road and in the valley) include Blue-grey Robin, White-breasted Fruit-Dove, Papuan Mountain-Pigeon, Madarasz’s Tiger-Parrot, Papuan Boobook, Stout-billed & Black-bellied Cuckoo-shrike, Lesser Ground-Robin, Rufous-naped Whistler, Lorentz’s Whistler, Slaty-chinned Longbill, Mountain Peltops and Superb Bird-of-Paradise. Moving higher up on the trail the forest changes in character to dry ridge top forest with scattered pandanas palms. This is great habitat for Brown Sicklebill, Yellow-billed and Orange-billed Parrot, Belford’s Melidectes and Lorentz’s Whistler. This is also the habitat to look for Archbold’s Bowerbird and birds have been seen around a small pond about half way along the track. Splendid Astrapia are also present in this area. Higher up still, within the dry ridge forest before the trail descends slightly towards Lake Habema is a great place to look for some of the high mountain specialities of the region, including Sooty Melidectes, Mountain Robin, Macgregor’s Honeyeater-of-Paradise, Crimson Firetails and Greater Ground Robin. The track next descends to the plateau of the Habema valley, with the lake visible in the distance. Soon after the descent there is a small hut on the left, known to some (but not all!) as ‘Pondok Tiga’ (“Camp 3”). This is a great place to stay for a few days as from here it easy to access a range of good habitats, including the main track back towards Wamena (as above), the grasslands around Lake Habema itself (more below), and the start of the famous Ibele trail. This trail drops away to the north close to Pondok Tiga. The first section (200m) is a fairly open grass and scrub clearing, from there the trail enters dwarf mossy forest for around 1km, then reaches as small stream and continues down. The first section of this trail, the clearing and the mossy forest, abounds with birds including Macgregor’s Honeyeater-of-Paradise, Northern Logrunner, Chestnut Forest-rail, Wattled Plougbill, Blue Ifrita, Sooty Whistler, Crested Bird of Paradise, Lesser Melampitta, Torrent Lark (on the stream), White-winged Robin, Brehm’s and Painted Tiger-parrot. New Guinea Woodcock and Archbold’s Nightjar are also regularly seen around the clearing, and Greater Ground-robin has also been recorded here. A trip across the grasslands towards Lake Habema is also a must, to pick up Salvadori’s Teal on the lake and Papuan Grassbird, Snow Mountain Partridge, Snow Mountain Munia and Alpine Pipit in the grassland. A strange isolated population of Australian Kestrel is also found here. While some birders opt just to stay near the main Wamena-Lake Habema track, others opt to walk the Ibele trail back to Wamena. This trail starts as indicated above, and the first section makes for great birding. The trail follows the stream for a distance, making birding quite hard, but eventually verges right and enters nice forest for birding again. At this lower altitude birds seen regularly include Black Sitella, Loria’s Bird-of-Paradise, Garnet Robin and Blue-gray and Black-throated Robins, Mountain Mouse-Warbler, Black-breasted Boatbills and Lesser Ground-Robin. After this section the trail reaches a hut in a clearing at a place known as Yabogima that many birders use as camp. The Yabogima area is worth a stay of a night or two as the forest nearby supports Brown Sicklebill, King-of-Saxony Bird-of-Paradise, Archbold’s Bowerbird, White-breasted Fruit-Dove, Papuan Mountain-Pigeon, Papuan Lorikeet, Brehm’s Tiger-Parrot, Great Wood-Swallow and Mountain Peltops. Below Yabogima good condition forest soon runs out, to be replaced by orchard groves and finally open fields near the village of Habema. Any patches of degraded forest are worth a look however as these lower altitudes support a different ranges of species that includes Superb Birds-of-Paradise, the distinct Papuan race of Golden Whistler, Black-breasted Munia, Short-tailed Paradigalla, Mountain Kingfisher Torrent Flycatcher and Ornate Melidectes. If you have a day or two to kill around Wamena it is worth getting a car or bike ride out of town. 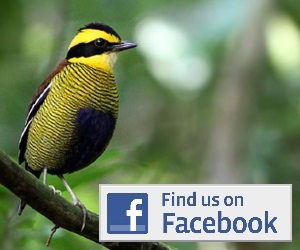 One site that birders often visit is the glamorous looking Baliem Valley Resort. This hotel is about 40 mins drive from Wamena and both the approach to it through wet grassland, and the area around it with scrub and a small patch of forest made for quite interesting birding. Here can be found Black-breasted Munia, Golden Whistler, Ornate Melidectes, Buff-faced scrub-wren and Great Woodswallow. The marshland is also a good place to try for Lewin’s Rail and Spotless Crake, and Papuan Harrier. For those bent on adventure, and the pull of one of Papua’s most elusive endemics, the Snow Mountain Robin, a trip to the upper slopes of Trikora may appeal. Snow Mountain Robin lives on high scree slopes between 4000 -5000m. The start of the trail to Trikora is near Lake Habema and from there it is up, up and up. The round trip takes 3-4 days and apart from the robin probably wont get you any species that you can’t see more easily around Lake Habema. But it will get you the robin, and you wont see that around Lake Habema! For some really un-chartered birding there is now a half descent road that goes from Wamena down to the lowlands to the north. This doesn’t yet join up with any other road network, so it may best be treated as a round trip down and up again. The road is alleged to pass through good forest for much of its distance, and the range of altitudes passed through should ensure the birding is varied and rewarding. If anyone tries this route please post some details back here! Wamena is accessed by air from Jayapura (Sentani Airport). There are numerous flights a day and if the views are clear it is a spectacular journey. Almost all birders hoping to birdwatch around the Baliem Valley hook up with a local guide outfit. This is the most advisable thing to do as the logistics and bureaucracy involved in getting to places like Lake Habema, or the Ibele trail are quite complex, and camping is really the only accommodation option. There are several guiding options that will take care of you, fix up cars, porters, tents, food etc. but none of them come cheap. Wamena and the Baliem valley is an expensive place. Several options that people use regularly, and how to contact them, are listed below. A good guiding outfit will quote you an inclusive figure for what you are asking for, and not include hidden costs during the trip, they will also be able to take care of the permission to use the Habema trail, which usually involves a good relationship with the army and payment of the appropriate fees.